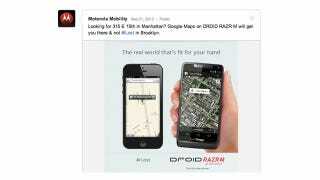 Did Motorola Fake an Address to Make Apple Maps Look Even Worse Than It Is? Everybody—or well, almost everybody—knows that Apple Maps is inferior to Google Maps. There are countless examples of Apple Maps being worse! Motorola, however, ignored all the real examples and used a fake address to show off how Google Maps is better than Apple Maps. Huh? Clever little Moto! Creating a nice and convenient hashtag for Apple map fails! Showing side-by-side comparisons of the two maps! It's definitely effective. But the address is 'fake'. AppleInsider discovered that there's no real address listed at 315 E 15th St in Manhattan New York—it's a public park, not an address listing. Basically, no one would really search for 315 E 15th St in Manhattan because it doesn't exist. What was apparently once the 300 block of East 15th Street is now named Marlborough Road. Five blocks away, Marlborough Road turns into E 15th Street, where numbers begin on the 800 block. When you clarify the '315 E 15th St' search to include Manhattan, Apple Maps actually points to the same non-existent address that Google Maps does. But without the Manhattan-clarifier, Apple Maps points towards an actual address listing before going to the made up address. It chose the address that someone might search over the one that no one should search. That actually makes sense, right?